DoubleTree Hilton Hotel Zanzibar, Double Tree Hilton Beach Hotel, Hilton Beach Resort, Zanzibar North Coast Hotels, Gemma dell Est Resort:-A guide to accommodation in Zanzibar inclusive of hotels in Zanzibar Stone Town, East coast Beach hotels, South coast hotels, North East Coast Hotels and activities diving and snorkeling, dhow and dolphin safaris, wind surfing, deep sea fishing. Nestled between swaying palm trees, pristine white beaches and the historic fishing village of Nungwi, the beautiful Doubletree by Hilton Resort Zanzibar-Nungwi in Tanzania is situated on the northern tip of Zanzibar - only an hour's drive from the Historic Stone Town and Airport. The exotic and elegant hotel features modern amenities suited for both business and leisure travellers. The Doubletree Hilton Resort Zanzibar-Nungwi offers a memorable culinary experience, ranging from fresh seafood BBQ's on the beach to fusion cuisine served in the Ngalawa restaurant, with impeccable service and an extensive wine selection. Plan the beach wedding of your dreams or renew your vows under the starry night sky, Nungwi style. Welcome and 'Karibu' to the magic of Doubletree by Hilton Resort Zanzibar-Nungwi. The staff look forward to welcoming you upon arrival with a warm, signature Doubletree Chocolate Chip Cookie. 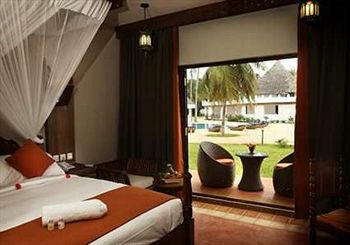 Double tree Hilton Hotel is located at Nungwi about 50 km. Stone Town, the Island Capital is just a mere 55 minutes drive passing rural villages through the intriguing countryside. Unwind in a beautiful Guest Room, with private balcony offering panoramic ocean views. Each room is fully air-conditioned with ceiling fan option. Refresh with a variety of Neutrogena amenities in the shower or bath tub, relax and watch a movie or one of the satellite TV channels on the LCD TV or dine in the comfort and privacy of your Guest Room with 24-hour Room Service. The Sunset Grill and Views Bar Lounge at the Doubletree by Hilton Resort Zanzibar - Nungwi offers a mouthwatering array of international and fuzion specialties. The Views Bar and Lounge also offers a wide variety of alcoholic and non-alcoholic beverages and authentic Shisha aromatic tobacco. Due to the great popularity of this venue, we recommend reservations to avoid disappointment. Adjacent to the Ngalawa restaurant, The Fisherman's Restaurant and Bar is designed as a traditional Zanzibari beach restaurant. Enjoy a large variety of fresh, continental meals, delicious light snacks and tempting cocktails or simply sip a cold beer or a glass of wine while you play a leisurely game of darts or pool. A favorite venue with guests, The Fisherman's Restaurant and Bar is an ideal location to watch the local village fishermen at work or gaze at the boats going out to sea. For conference and meetings Hilton Doubletree Zanzibar has a Business Center offering phone services, express mail, photo copying, fax, printing and Video Conferencing. The safari office organizes safaris to Stone Town, Jozani forest and spice island tours.